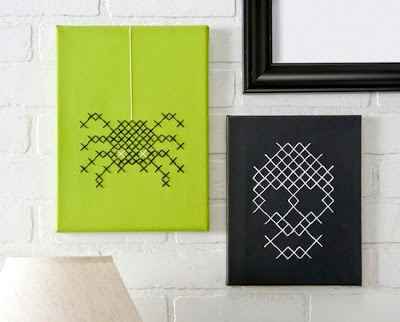 Hey, while we're on the subject of cross stitch, have you seen the stitched Halloween wall art at Decor Hacks? Find the tutorial right here. In other news, I just attempted to fold this origami spider. The video tutorial is good... except I used regular printer paper which is too thick. 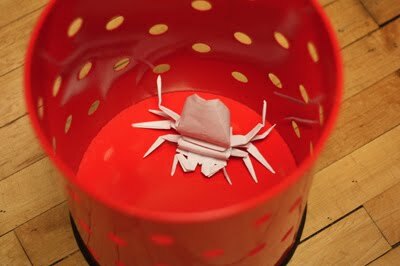 Use origami paper, or there will be too much bulk to deal with and the spider's rear will stick straight up in the air. My spider now lives in my trash can where he will be joined by other garbage and hauled off to the recycler. Origami fail. You have read this article halloween / tutorials with the title Stitched Halloween wall decorations. You can bookmark this page URL http://jenkrebs.blogspot.com/2012/10/stitched-halloween-wall-decorations.html. Thanks! No comment for "Stitched Halloween wall decorations"